Porto-Vecchio is a commune in the Corse-du-Sud department of France on the island of Corsica. You'll explore the less-touristy side of things at Sentier Littoral des Bruzzi and Plage du Petit Sperone. Visiting Scuba & Snorkeling and Reserve Naturelle des Iles Cerbicales will get you outdoors. Explore the numerous day-trip ideas around Porto-Vecchio: Bonifacio (Grottes de Bonifacio & Escalier du Roi d'Aragon (King Aragon Steps)). There's more to do: stroll through Tamaricciu Beach and stop by L' Alivi. To find maps, other places to visit, ratings, and other tourist information, read our Porto-Vecchio trip planner . Sydney, Australia to Porto-Vecchio is an approximately 28-hour flight. You can also do a combination of train and flight. Traveling from Sydney to Porto-Vecchio, you'll gain 9 hours due to the time zone difference. Prepare for cooler weather when traveling from Sydney in February: high temperatures in Porto-Vecchio hover around 15°C and lows are around 5°C. Finish your sightseeing early on the 18th (Tue) so you can drive to Calvi. Calvi is a commune in the Haute-Corse department of France on the island of Corsica.It is the seat of the Canton of Calvi, which contains Calvi and one other commune, Lumio. Get outdoors at Scuba & Snorkeling and Balagn'Ane Asinerie. You'll explore the less-touristy side of things at Dans les Yeux de Lucie and Golf du Reginu. Change things up with these side-trips from Calvi: FRAGNU (in Montegrosso), Eglise de la Sainte-Trinite et de Saint Jean-Baptiste (in Aregno) and Eglise de Sant'Antonino (in Sant'Antonino). The adventure continues: head outdoors with Cirque de Bonifatu and enjoy the sea views from Leuchtturm La Revellata. To find more things to do, other places to visit, and other tourist information, refer to the Calvi online trip planner . Traveling by car from Porto-Vecchio to Calvi takes 3.5 hours. Alternatively, you can take a bus; or do a combination of bus and train. In February, daily temperatures in Calvi can reach 15°C, while at night they dip to 6°C. Finish up your sightseeing early on the 21st (Fri) so you can travel to Marseille. Kick off your visit on the 22nd (Sat): take in the spiritual surroundings of Abbaye Saint Victor, then take in the spiritual surroundings of Basilique Notre-Dame de la Garde, then appreciate the extensive heritage of Vallon des Auffes, and finally take in the dramatic natural features at Calanques. Get ready for a full day of sightseeing on the next day: contemplate in the serene atmosphere at Cathédrale La Major, step off the mainland to explore Chateau d'If, and then contemplate in the serene atmosphere at Paroisse Cathédrale Saint Sauveur Aix-en-Provence. For ratings, reviews, traveler tips, and tourist information, read Marseille journey planner. Traveling by flight from Calvi to Marseille takes 2.5 hours. Alternatively, you can do a combination of bus and flight; or do a combination of flight and train. In February in Marseille, expect temperatures between 14°C during the day and 4°C at night. Cap off your sightseeing on the 23rd (Sun) early enough to go by car to Carcassonne Center. Get some cultural insight at Historic Fortified City of Carcassonne and Château de Salses. You'll discover tucked-away gems like La cité médiévale and Eglise Saint-Nazaire. 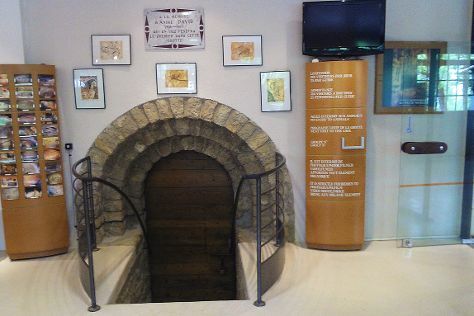 Step out of Carcassonne Center with an excursion to Source Salee de la Sals in Sougraigne--about 54 minutes away. There's still lots to do: contemplate the long history of Cathar Castles, stop by Jeff de Bruges Carcassonne, trek along Mayronnes Sculpture Trail, and step into the grandiose world of Chateau Comtal. 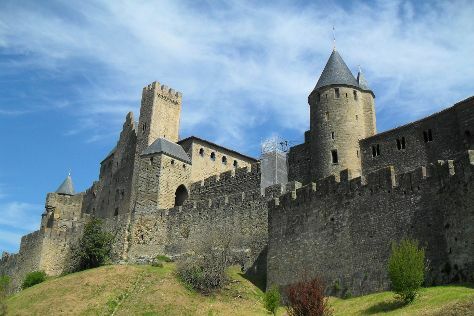 For more things to do, ratings, other places to visit, and tourist information, you can read our Carcassonne Center trip itinerary site . You can drive from Marseille to Carcassonne Center in 3 hours. Alternatively, you can take a train; or do a combination of flight and train. Expect a daytime high around 11°C in February, and nighttime lows around 2°C. Cap off your sightseeing on the 26th (Wed) early enough to go by car to Sarlat-la-Caneda. Do some cultural sightseeing at Chateau de Beynac and The Maison Forte de Reignac. Visiting Plan d'eau le Lac Vert and Grotte du Pech-Merle will get you outdoors. Venture out of the city with trips to La Foret des Singes (in Rocamadour), Forteresse de Miremont (in Mauzens-et-Miremont) and La Sente aux Cochons (in Neuville). The adventure continues: contemplate the long history of Chateau des Milandes, stop by Les Gourmandises de Lucco, step into the grandiose world of Chateau de Lacypierre, and identify plant and animal life at Site Corot. Plan a Sarlat-la-Caneda trip in moments using our itinerary builder. Traveling by car from Carcassonne Center to Sarlat-la-Caneda takes 3 hours. Alternatively, you can take a train; or do a combination of bus and train. Expect a daytime high around 13°C in February, and nighttime lows around 2°C. Cap off your sightseeing on the 1st (Sun) early enough to travel to Orcieres. Your cultural itinerary includes sights like Fort Vauban and Citadelle Vauban. Escape the urban bustle at Esf Chabanon and Ski Orcieres Merlette. Explore Orcieres' surroundings by going to L’Accrobranche Serre-Poncon Aventure (in Chorges), Pure (in Vars) and The Petrifying Fountain of Reotier (in Reotier). To find ratings, maps, reviews, and other tourist information, read Orcieres trip itinerary site . You can drive from Sarlat-la-Caneda to Orcieres in 7.5 hours. Another option is to fly. Traveling from Sarlat-la-Caneda in March, you will find days in Orcieres are little chillier (15°C), and nights are about the same (1°C). Finish your sightseeing early on the 5th (Thu) to allow enough time to travel to Nice. Get outdoors at Lérins Islands and Mala Beach Coastal Path. Step off the beaten path and head to Villa & Jardins Ephrussi de Rothschild and Le Sentier du Littoral, Cap d'Antibes. Venture out of the city with trips to Cannes (La Croisette, Rue d'Antibes, & more), Verrerie Pierini (in Biot) and Station de Ski L'Audibergue (in Andon). There's still lots to do: get to know the fascinating history of Vieille Ville, wander the streets of Avenue Jean Medecin, let the river carry you with Nice Rafting, and pause for some serene contemplation at Eglise Saint Jean Baptiste. To find ratings, reviews, photos, and more tourist information, use the Nice tour planner . You can drive from Orcieres to Nice in 4 hours. Plan for somewhat warmer nights when traveling from Orcieres in March since evenings lows in Nice dip to 9°C. Wrap up your sightseeing by early afternoon on the 13th (Fri) to allow enough time to travel back home.